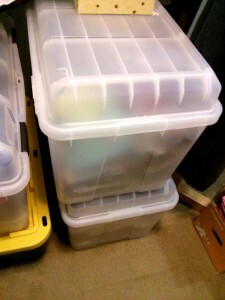 Home » Occupational Therapy » Drowning in Toys after the Holidays? The holidays are done for most of us, and now it is time to control the chaos in a house filled with new toys. As an adult, I can’t stand clutter. Everything needs to be organized for me to be able to think clearly and function well in my home. My children disagree and would prefer to leave all the new toys out everywhere. Despite my children’s love of clutter, I know that they function better in an organized environment as well. I’ll allow as many toys as are actually being played with out at one time, but the rest need to be put away on a regular basis (meaning multiple times a day). 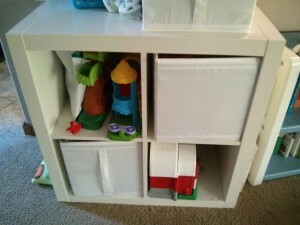 Everyday, Simple Idea #10: Toy Rotation– It is a great time to put away some old toys to make room for the new ones. Your kids may protest now (or they may not even notice with all the new toys around), but everyone will be happy in a few months when you open the storage bins to rediscover the old toys. This is also a good time to decide what toys your children have out-grown that are due to be donated or handed-down to a friend or family member. Remember, less is often more when it comes to children’s play. Everyday, Simple Idea #8: Toy Storage– Having organized play spaces can make a huge difference in how children attend to play and learn. Putting in some time to create (and maintain) play spaces is worth it in the long run for both you and your kids.